Hey there, today we’re going a little gospel, not just to help you find the best Bible apps for Android, but the Best Youversion Bible Apps For Android. Now, what’s the special thing about Youversion Bible, well I’m going to explain that right about now. Youversion Bible is also a Bible or you can say a Bible app, usually an online Bible app with a whole lot of platforms and basically a lot of Bible translations and references. with Youversion Bible you can have almost an unlimited access to virtually all the Bible translation online, and for some specific Bible apps, you can save those translations for offline use too. Now, the fact that you have an Android device and you can download a Bible doesn’t take away the fact that you should go to church without your physical Bible. Youversion Bible Apps For Android are meant to help Christians access the word of God wherever they are and whenever they want to. You can be in a shopping mall to get some provisions and you obviously didn’t carry your physical Bible, but with your Youversion Bible, you can read the word of God anytime, while standing in a cue to pay for your stuff. So, with all that been said, let’s take a look at some of the Best Youversion Bible Apps For Android I got. Youversion Bible App is an extraordinary Bible that lets you read the word of God anytime and listen to the word also on audio. Amazing right, just anywhere you are right now, you can pick out your smartphone and open your version bible app and start reading the Bible without stress and you can even highlight some portions of the scripture you might want to come back to at a later date. Now, you can customize this Youversion Bible app and use bookmarks, highlights, and notes to keep the record of your activity in the app. There are over 1400 Bible translations in this app, with over 1000 languages that you can switch to if you are not an English speaking person. You can activate the app’s widget and get a ‘verse a day’ notification and keep yourself apprised on the word of God. Regardless of the online feature that lets you gain access to a lot of things, you can also use the Bible when you don’t a stable or available WiFi. This app has been downloaded by over 300 people around the world and it’s just 15MB in the installation size. With this Youversion Bible, you can read your Bible various Bible versions, without any stress. This app is basically here to help in your daily activities when it comes to staying on the word of God. The fact that it’s in your Android device makes it a whole lot easier, as I always say, that doesn’t make the hard copy Bible useless or not effective, it just means that with this kind of Bible with its many versions. Multiversion Bible Offline is totally free and works perfectly on offline mode. This Bible comes with a few free versions, but the rest may need a WiFi or any internet connection whatsoever to download and then save for offline use. This app has over 10 million downloads and is just 7MB in the installation size, so click our download link below and get on it. This Youversion Bible works amazingly offline, view chapters of the Bible with this app for free, totally not a paid app, so basically you don’t need a WiFi connection or an internet connection either, just open the app and start reading the undiluted word of God. Now, as the name implies, Multi versions Bible, a lot of versions of the Bible are available, and basically, so it is for every Best Youversion Bible Apps For Android. Now, as a Christian, we sometimes don’t understand at first and fully the word of God when we read it from the Bible, that is why we need some other translations to make things clearer for us, that is why this Bible app has it all for you, from KJV to NKJV, NIV, NLT, AMP, RSV, MSG, ASV, and many more. To add to that, while reading there is a feature that allows you to check the meaning of some Greek words that might confuse you. So you can check up words, take notes and highlight text, all this in an 8MB sized Youversion Bible app, that is literally one of the Best Youversion Bible Apps For Android. This Bible may not exactly be reaching for the top shelf as one of the Best Youversion Bible Apps For Android, but this is one of the most convenient Bible apps on google play store. Very easy to use, highlight text, can listen to the audio Bible as well, can take notes, can even save some scriptures for reference purposes. When you talk about a full package Bible app, this bible app should be found on your list, it has everything you need to fully understand the word of God through your Android device. 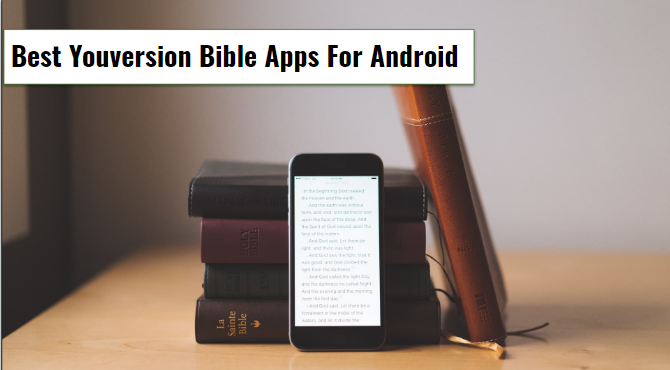 You can customize this Bible app, switch to day or night mode, connect to the internet and download various Bible versions, but apart from that, you don’t need any internet connection to read or listen to downloaded Bibles on your smartphone. You can create folders to put your notes and bookmarks in an organized manner, a unique split screen mode allows you to view two different Bible translations at the same time, isn’t that amazing. You can download all this for just 10MB in the installation size. This is, not just any ordinary Youversion Bible on google play store, this King James Bible is also an amazing intense study Bible with strong concordance and everything you need to study your Bible and get the revelation of God’s word clearly. This Bible is totally offline and completely free, with the audio Bible mode, all you got to do is to click on the download link below and download this amazing Bible amongst my Best Youversion Bible Apps For Android. You can use some certain keywords to search for passages in the Bible app, and even share such passages with friends. Basically, this Bible app has got you covered, daily inspirational Bible verses will be popping up and you can always stay spiritually connected to your Youversion Bible app even when you are not present in the app. This Bible app is just 16MB in the installation size, you can bookmark pages and passages, take notes, highlight text and lots more, God’s word at your fingertips. An amazing list of the Best Youversion Bible Apps For Android has been put up for you to check out and download to keep yourself up to date on everything that has to do with the word of God. Some of the Best Youversion Bible Apps For Android on my list are both online and offline, any time of the day, you can access the app, switch to any language you prefer and read and also listen, audio mode available. Youversion Bible apps are very essential and extremely important to every Christian with an Android device, so don’t let your smartphone go to waste, click the download link below each of my Best Youversion Bible Apps For Android and download one or more Youversion Bible apps on your smartphone. Finally, I want to say a big thank you to all my viewers, thanks for viewing and as always, it’s a pleasure to have you, God bless and see ya!